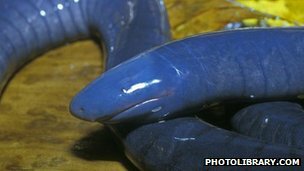 A UK-Indian team of scientists have announced the discovery of a new species of limbless amphibian. The animal was identified by accident in the Western Ghats area in the state of Kerala, South India. The specimens were found inside moist soil after digging the shrub-covered bank of a mountain stream. The creature - about 168mm in length and pink in colour - belongs to an enigmatic, limbless group of amphibians known as the caecilians. Ramachandran Kotharambath, lead author of the report, told the BBC Tamil Service that the animal was identified as a new species following extensive comparisons with other, similar examples from this amphibian group. 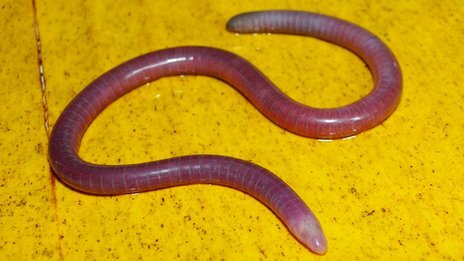 According to the researchers, specimens of the novel caecilian - named Gegeneophis primus - were collected during field works in two consecutive monsoons, first in October 2010 and then in August 2011. They were discovered at a valley on a plantation in the Wynad district of Kerala. Active collaboration The new finding was made as part of a longstanding research collaboration between the department of zoology at the University of Kerala and London's Natural History Museum. The Central University at Kasargod in Kerala also contributed to of the discovery. The finding has been reported in the latest edition of the academic journal Zootaxa. The wider distribution, natural history and habitat preferences of the species are yet to be determined. The discovery of this species indicates that the caecilian amphibians might have great diversity all along the Western Ghats area said Mr Ramachandran. The new species do not face any immediate threat as long as the habitat structure is maintained, according to the scientists. They also say that they need to know how far and wide this species is distributed and what are the habitat requirements. Co-author Dr Oommen says the discovery was significant since the finding ended a hiatus of almost half-a-century. "It highlights the fact that the knowledge of caecilian amphibians of the Western Ghats remains incomplete and in need of further study."